When the sommelier poured into my glass, I observed a lot of bubbles, then it quickly fizzled out. Meanwhile the nose was screaming aged yeast. These two characters led me to believe this champagne was aged, as old as 88 or so. 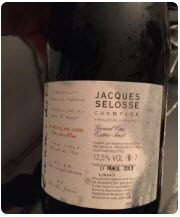 Once again I was fooled by Selosse crafty workmanship of “faking aged champagne!” This bottle came from Mesnil, the best plot in Champagne. I really enjoyed the palate, extremely soft and pleasant that not many champagnes are like this. I hope I have learned my lesson! The nose was decent with quite a good balance of fruits and oak. One sip and I wasn’t happy about it; it was obviously a cheap taste, and somehow I felt it was using some wood chips for aging rather than proper wood barrel. I further suspect that maybe artificial sugar was added to the wine, which made it taste cheap and somehow diluted, something like store bought grape juice. Pretty good! Richness, lots of dark fruits, black currants, cherry with creamy vanilla. 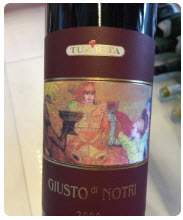 A big wine, tannic but full of fruits! Wine turned diluted in mid palate yet the fruits continue to punch in the backend! 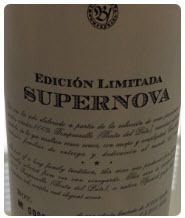 Intense nose, well balanced between the aromas of very ripe black fruits and the noble wood providing cocoa, vanilla. 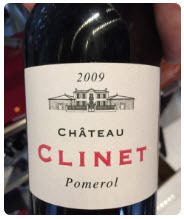 A pity it’s too young, I will age it for another 5 – 8 years to achieve a mellow character and melted tannins! Spectacular, I enjoy the sensation of fullness and harmony! La Tache is not a wine you get to drink often. 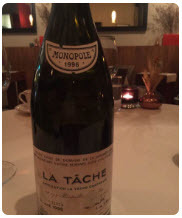 I was lucky enough to have good friends around to offer me a great vintage La Tache. 1996 by all means was a great vintage for red burgundy, and this label performed extremely well tonight. The Ying side of La Tache was the feminine aspect, the most elegant burgundy you can find by any standard. The Yang aspect was the masculine portion, very structured, very big and bold. It’s extremely rare to find a red burgundy that possessed such character. A great vintage made a lot of difference when it comes to a great champagne. 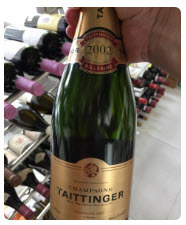 I had some Taittenger NV in the past, never really impressed by it. But today’s lunch, I truly enjoyed this vintage 2002 champagne. Ripe lemon and citrus alongside with some floral notes hit the nose. 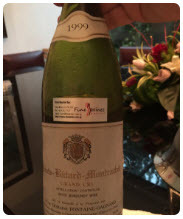 Palate was still laser sharp despite 14 years old, and the secondary flavor of ripe fruits and lemon starting to evolve. Good bubbles and very balanced. I urge anyone serious to keep great vintage champagne. Thick, broad and luscious palate striked me with a hammer, quite unlike the previous Criot Batard Montrachet from Fontaine Gagnard which was usually soft and luscious. Not likely to be premox as there’s no bake apple. Perhaps advance maturity, or storage issue, or something else I’m not aware of….. still pondering. Despite the fact that I gave it 5 stars, it wasn’t equivalent to RP100 as I would disagree with Parker that this was anywhere near a perfect score. 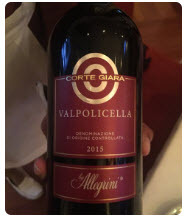 I hardly come across any wine that resembles this one that’s totally filled with nothing but concentrated dark cherries all around, shockingly good! I was also impressed with the palate, very creamy and smooth, plush, and rich. Every sip was like chewing on a bunch of dark cherries. I paired it with homemade spaghetti bolognese with an extra doze of Parmesan cheese spread.